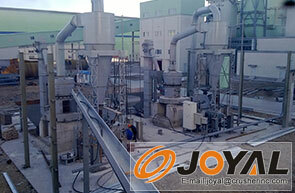 JOYAL High Pressure Mill is an improved type of Raymond mill. 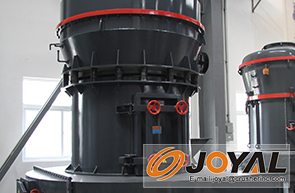 The purpose of the this kind mill is to grind non-flammable and non-explosive materials in the fields of building materials, mining, metallurgies and chemical industry with hardness less than 9.3 in Moh’s scale and humidity less than 6 percent. Examples of the materials are: quartz, feldspar, barite, fluorite, dolomite, garnet, bauxite, zircon, marble, calcite, iron ore, rock phosphate, coal, slag and so on(400 kinds of material). 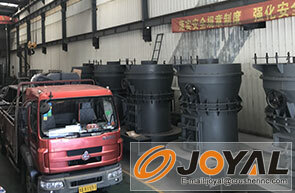 The granularity of the final products can be changed from 30 to 425 meshes. 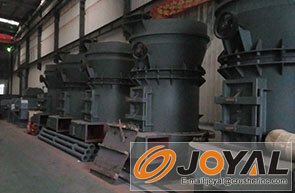 Detailed:The High-pressure Suspension Mill has the same working principle as Raymond Mill, but its grinding fitting is furnished with 1000 - 1500 kg pressure spring. 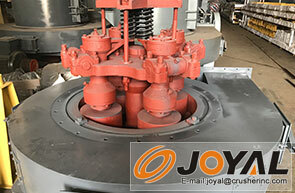 When the machine works, the grinding roll, under the action of high pressure spring and centrifugal force, rolls close up to grinding ring, its rolling pressure ratio is 1.2 times of Raymond mill given an identical condition, and its output may increase 10% to 20%；Please note that when the grinding roller and grinding ring reach a certain degree of abrasion, please adjust the length of high-pressure spring to keep the constant grinding pressure between grinding roller and grinding ring, so as to ensure a stable output and fineness.